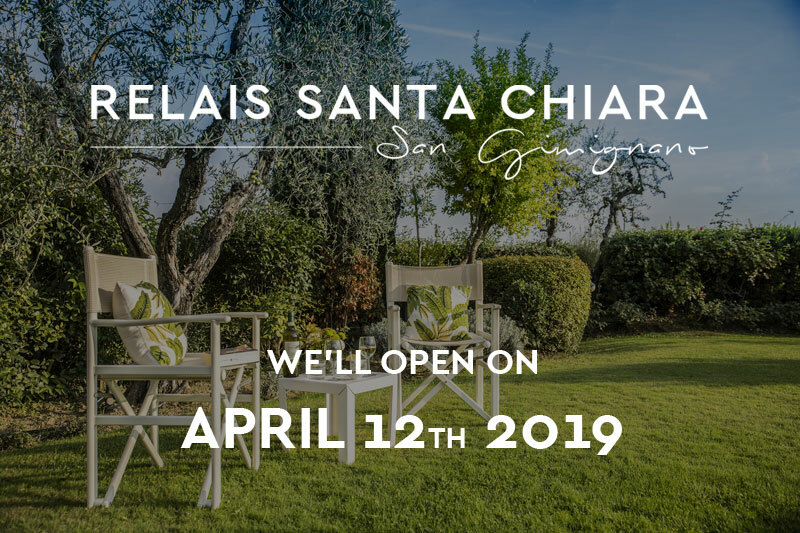 Relais Santa Chiara is a wonderful Hotel in San Gimignano immersed in the nature of the Tuscan hills, just a few steps from the historic center. Its ideal location allows you to experience all the magic of the Tuscan countryside while being a short walk to the medieval walls of the center of San Gimignano, an enchanting village declared an UNESCO World Heritage Site. The Relais Santa Chiara Hotel is looking forward to welcoming you to an elegant and unique environment surrounded by breathtaking views and pampering you on the beautiful, shaded terrace and Mediterranean garden with swimming pool. The seventeen towers of San Gimignano drew nearer and nearer. It was like a dream that could not possibly be true. Staying at the Relais Santa Chiara Hotel means being pampered by an always attentive and hospitable staff, allowing moments of total rest and tranquility. Many of our elegant rooms offer a view of the magnificent expanses of vineyards and olive groves of the Tuscan countryside and the enchanting swimming pool framed by the private garden. The ideal location allows you to reach the historic center of San Gimignano in just a few minutes, and to discover the fascinating treasures of Tuscany such as the nearby Siena, Volterra and Florence. View our rooms and experience the magic of San Gimignano. Discover our offers in San Gimignano for your holiday in Tuscany. Reserved parking spaces available in our private lot. We were part of a touring group of 30 friends who stayed here for a week with daily excursions from this hotel, our base. Everything about it was delightful! It started with a delicious wine and appetizer event. Our room was very clean and comfortable with a balcony overlooking the pool. The staff was kind and helpful. The breakfast was delicious with SO many choices and the waitstaff was very attentive. So many lovely touches here and there. Very peaceful if quiet is what you needed. Only a five-minute walk to restaurants and the walled city. When it was time to move on, it was hard to leave! The Santa Chiara scores on three vital points- the facilities are spotlessly clean with no frills but plenty of comfort, the staff and owner could not be nicer or more helpful and top of the list the location is simply the best. Good safe parking on the edge of town then just a 5 minute stroll into the ancient medieval city to enjoy all the gorgeous attractions San Gimi has to offer. Plus excellent food at breakfast or lunch, a fantastic view, peaceful silence and a lovely pool. We stayed one night then booked for two more the next week, it was great. Thank you.